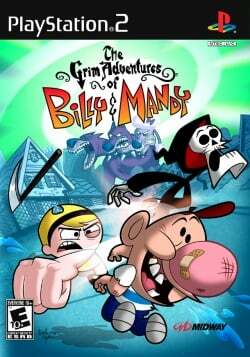 Game description: The Grim Adventures of Billy & Mandy videogame pits 15 characters from the popular television show against each other in a fighting/adventure game filled with mayhem and chaos. Whether players use Billy's gas attack or Mandy's deadly smile, all of the characters will feature individual abilities based on their personalities. Players will be able to smash objects, destroy environments and battle in 20 fully interactive environments from the show. In battle mode, up to four players can use a multitude of weapons in destructible arenas like the "Desert of Doom" and the "Underworld" to battle it out and be the last one standing. Players also have the option to play on their own or with a friend in mission mode, a series of 45 missions where players can unlock new weapons and characters like Hoss Delgado and Fred Fredburger. This page was last edited on 24 February 2017, at 17:00.